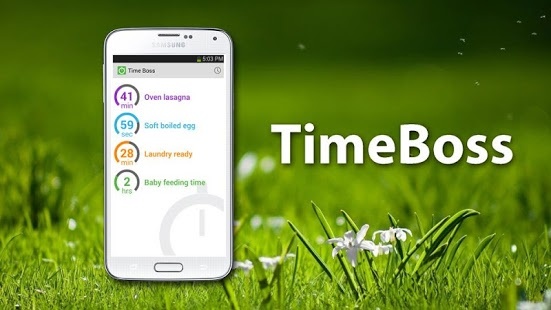 Set multiple timers for everyday tasks. Easy to use, beautiful, clear. top-web.us: "Highly recommended! ", gizmoeditor.com: "Clocks almost anything", hightechholic.com: "Love it! ", androidfreeware.net: "5.0/5.0", ilovefreesoftware.com "TimeBoss is an awesome Android timer app! 5.0/5.0", fasterland.net: "Highly recommended! ", 2015android.com (4.8/5.0), intellectuapp.com: "best timer app"
Set a timer's title, color, alarm sound, vibration, on-tap response, etc. Easy to use stopwatch that lets you record total time and lap times. Data can easily be saved to a text file on your phone for evaluation on a computer. Time Boss is completely free to use. Happy with TimeBoss 2? Get the PRO/donation version and buy me a coffee!